There are no internal flights. A good network of roads covers the entire island, but many are unpaved and covered in potholes (except for the main highway). Road safety is a national concern, especially after dark. 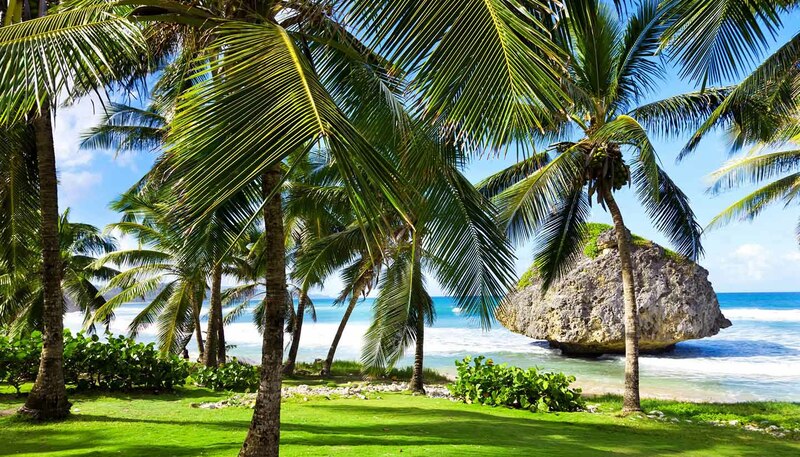 Hiring a car is the best way to explore Barbados, thanks to the fact it’s a well-developed, small island measuring just 34km (21 miles) long and 23km (14 miles) wide. You can hire anything from a mini moke to a limousine at the airport, at offices in Bridgetown or at main hotels. Traffic drives on the left. Drivers must be between 21 and 65 years of age to hire a car in Barbados, with a minimum three years' driving experience. Visitors to the island are easily identifiable on the road by the 'H' number plate. Locals are usually accommodating and make allowances for any confusion. Taxis are unmetered but charge fares regulated by the government which are based on the distance travelled. Check the rate before travel - it can be in US Dollars as well Barbados Dollars. Special deals apply for a full-day hire. Licensed minivans, identifiable by their 'ZR' licence plates, operate around the island and can be flagged down. There are no fixed schedules, but service is frequent. Rates are the same as for buses, although minivans tend to be quicker - but can be a tight squeeze. Scooter hire is available - you will need to pay a small deposit and wear a helmet, as required by law. Seat belts are compulsory. Speed limits are 40kph (25mph) in built-up areas and 60-80kph (37-50mph) outside urban areas. A Barbados driving permit is required. You can obtain this from car hire companies, the airport or some police stations. A valid national licence or International Driving Permit and a small registration fee are required. Barbados has a modern, reliable bus network, which operates from 0500 to midnight, while taxis are safe and reliable.